This 7.1 mile hike picks up right where we left off on our last Appalachian Trail segment. It turned out to be an easy section of hiking with many sweeping, panoramic views. The view from Loft Mountain is one of the nicest in the park. Below: Wookie perches on the tool chest at the Ivy Creek maintenance hut; Taking in the view from the first eastern-facing overlook. You’ll pass this spot on the initial climb up Loft Mountain. When we got to the Loft Mountain Wayside to begin our hike, the temperature was hovering right around 40 degrees and the wind was howling through the trees, making it feel quite a bit colder! I donned a fleece pullover, gloves and a hat for the first time since last winter. It was kind of nice to bundle up for a change. I actually enjoy cold weather and snow (although I dislike the short, dark days and bare-limbed trees that winter brings.) This was the valley’s first real cold-snap of the fall season, and I was glad we had a chance to get out for another hike. 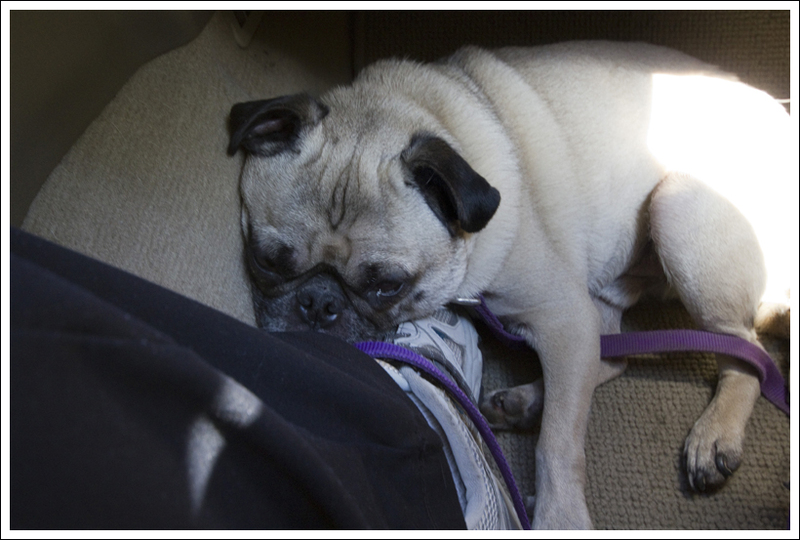 Since the hike was not too long or hard, we brought our pug, Wookie, along for the trek. The hike started off with a climb back up the Patterson Ridge trail and past the Ivy Creek Maintenance Hut to reach the point of the Appalachian Trail where our last segment left off. Most of the early part of this section is a gradual hike up Loft Mountain. After about a half mile of walking, I had already warmed up enough to ditch the hat and gloves. Climbing uphill is a great way to heat yourself! 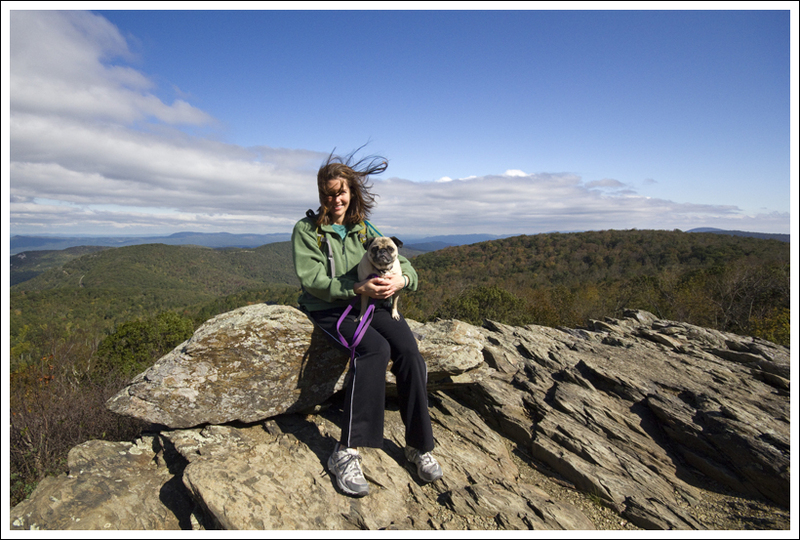 Christine and Wookie enjoy the windy view on Loft Mountain. Below: From Loft Mountain you get nice views of Massanutten peak and Skyline Drive; Wookie stays hydrated. I went into this section only expecting two nice views – the same ones we had seen when we hiked the Loft Mountain Loop a couple years ago. So, I was pleasantly surprised that the open vistas occurred pretty regularly throughout the entire distance of the hike. Instead of cutting a straight line through the middle of the camping area, the Appalachian Trail swings a wide arc around the area, adding distance but keeping the trail more scenic. 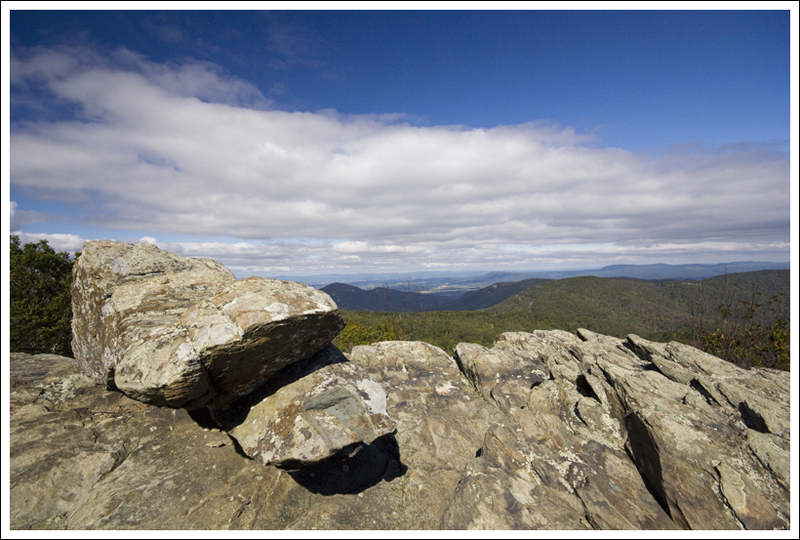 In fact, some of the nicest views came from rocky ledges not far off the trail behind the Loft Mountain campground. When we got to one of the overlooks near the campground, and I had a vivid flashback to my childhood. My family camped at Loft frequently when I was in elementary school. I remember our run-down, brown pop-up camper and the smell of bacon cooking over the campfire in the mornings. I remember my dad’s goofy-scary ghost stories, making s’mores and going for family hikes on the AT. So many fond recollections! But this rocky overlook stirred a memory that wasn’t so pleasant! I remember once when I was maybe seven or so, my parents let my brother and I go unsupervised to the overlook. It was only a hundred or so yards from our campsite and we were well within earshot of mom and dad. For some reason, I decided to sit right on the edge of the rock shelf and dangle my feet over the edge. It was all lots of fun, until it was time to swing my legs around and stand back up. When I tried to get up, I couldn’t do it. I was suddenly and utterly paralyzed with a fear of falling off that rock ledge. I screamed and cried and sent my brother running to get my dad. He dashed down, grabbed me under my armpits and yanked me back from the edge. I had really forgotten about that moment until we passed the spot on this hike. Looking at it again, it wasn’t quite as scary or precipitous as I remembered. This tree looked like one of J.R.R. 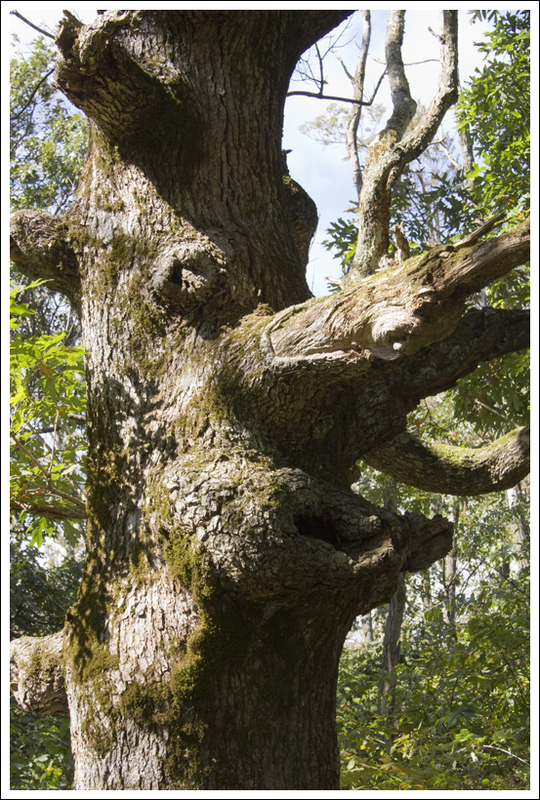 Tolkien’s Ents (see the eyes, nose and mouth?) 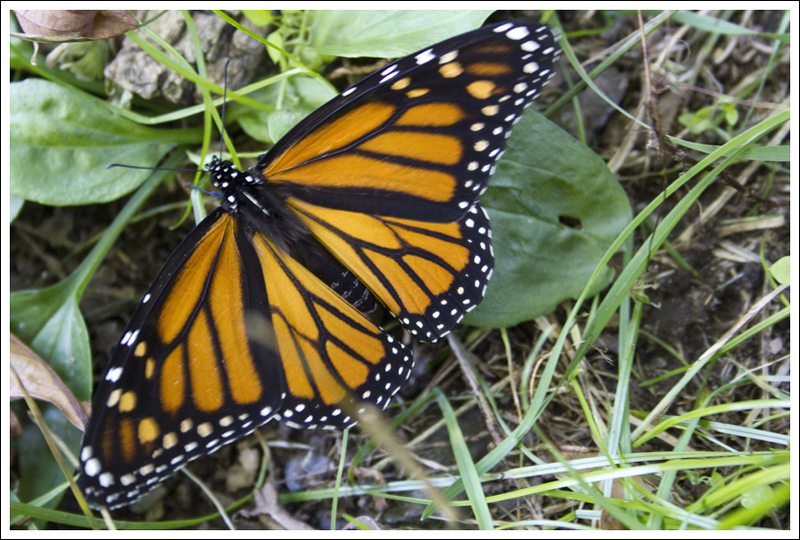 Below: Butterflies were abundant, but they were all weak and slow due to the cold temperatures. After leaving the Loft Mountain area, the trail is really easy. It’s either downhill or relatively flat for the remainder of the miles. We covered the distance at a really good clip. 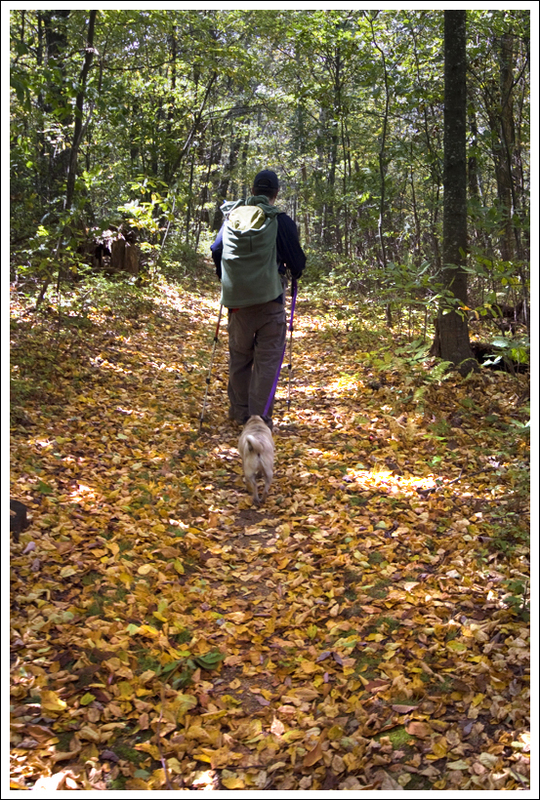 We passed quite a few other people out dayhiking – especially in the vicinity of the Doyles River-Jones Run trail. We saw a lot of dogs out hiking, too. All but two were leashed! This was unusual and very welcome! Wookie is always one of the smallest dogs on the trail, and big dogs sort of frighten him a bit when they come bounding up freely. 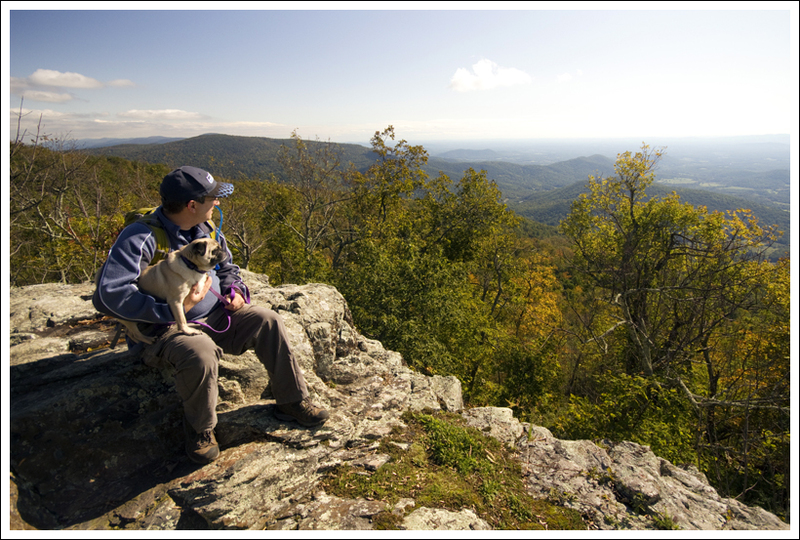 Near the end of the hike, the trail crosses a scenic overlook along Skyline Drive. Basically, you walk across the overlook and pick the trail back up on the south end of the paved area. A few tenths of a mile after that, the trail crosses to the west side of the Drive for the last mile of walking. Our other vehicle was parked at the end of the segment – in the Brown Gap parking area. Good hike! This section of the Appalachian Trail can look misleading on a map. On the road, it passes from mile marker 79 to 83, but the distance is longer on the actual trail since this section separates from the road to the east and winds around Loft Mountain and the Loft Mountain campground before rejoining the proximity of Skyline Drive again. We left one vehicle at Brown Gap and parked our first vehicle at Loft Mountain. 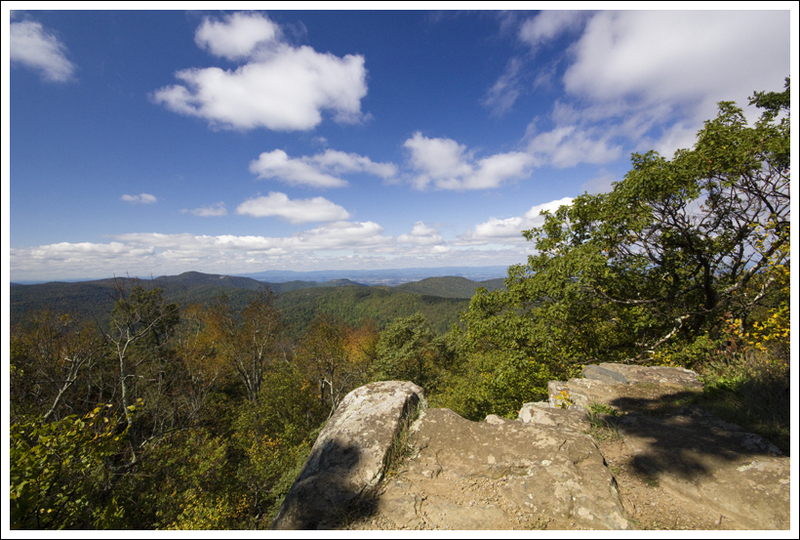 Some great views are a short walk from the Loft Mountain Campground. Below: Another nice view; Walking through the fallen leaves. To make sure we cover every inch of the AT through SNP, we started off our trail by going down the fire road on the north side of the Loft Mountain wayside, across from the street. You hurdle a small chain blocking off the fire road and then shortly take a right to head down the fire road. You will pass the Ivy Creek Maintenance Hut and spring after about .3 miles. At .6 miles, this fire road joins the white-blazed Appalachian Trail. Take a right to head south and begin your climb up Loft Mountain. At 1.1 miles, you reach a nice view to the east and at 1.6 miles you reach a few nice views to the west (along with an intersection with the Frazier Discovery Trail). The trail then begins to take on a quick descent from Loft Mountain. At 2.7 miles, you reach a post that shows a short side-trail to reach the Loft Mountain camp store. At this point, you will begin to make your way around the Loft Mountain campground. There are even a few trails to the campground, but you will see tents on a busy weekend through the trees. Around 4.0 miles, you will also find some nice views if you step out on to the rocks near the campsites. The trail begins to descend again. 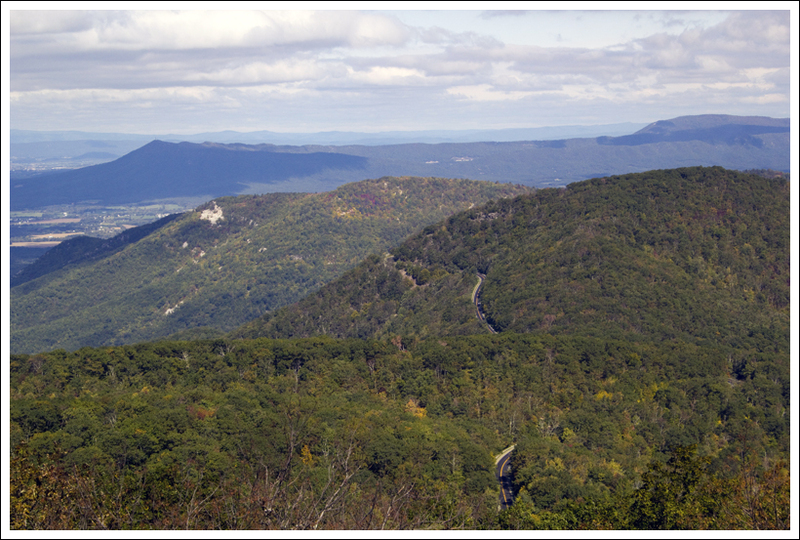 At 6.1 miles, you will cross Skyline Drive and at 7.1 miles you should reach your vehicle at the Brown Gap parking lot. Wookie was pretty happy with the hike. Below: As soon as the car started moving, he fell asleep. This section of the AT had several great viewpoints. The views from the top of Loft Mountain are in my opinion the best views from hiking in the southern section of SNP. You’ll get to see views of mountains for miles and you can even glimpse Skyline Drive snaking through the mountain ridge. It was also great to smell campfires from the Loft Mountain campground. The smell of campfires on a cool day defines outdoors in the fall to me. The day that we hiked this section happened to be JMU’s Homecoming. Since we graduated from there a while ago, most of our close friends no longer return. So, we typically try to avoid Harrisonburg that weekend, since it is packed with people at the restaurants, grocery stores, etc. When we were just about a mile from the end of our hike, a group was coming up the trail and I heard someone say “Adam”. It turned out to be a student assistant for our office and one of our JMU tour guides (of which, I used to serve as an adviser). He was backpacking for a few days with some other students in his law program at the College of William & Mary. It was great to catch up with him for a few minutes and it gave me a sense that we had our own version of Homecoming out on the trail. It was great to get outside and do a hike. On most trails, I tend to not be very confident with where I’m going. I typically have Christine walk me, but I heel closely right behind her ankles with Adam walking behind. This gives me a good buffer against anything we may come across on the trail. But, if we are doing an out-and-back hike, on our return trip I remember where we’ve gone before, so I’ll walk proudly in front. Since we did this with one car serving as a shuttle, I stayed in the middle on the hike. 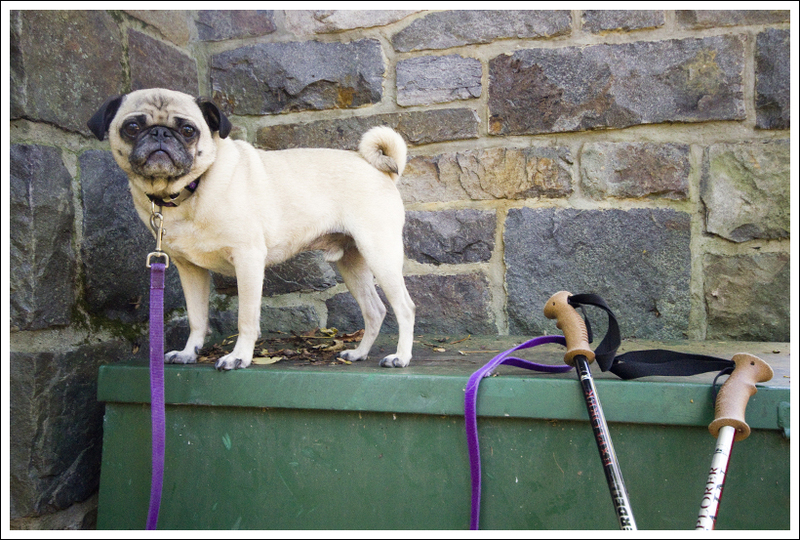 The hike wasn’t too tough, since I’m in pretty good shape for a pug. However, with about 1.5 miles left I started kicking my back foot out a little and was kind of limping along. When Adam noticed this, we stopped. It turns out I just had some mud between my pads which was making me step a little funny. They don’t make hiking shoes for dogs like me, so occasionally this happens. I did enjoy this hike, taking in the views and sniffing near the campgrounds for the smells of hot dogs cooking on the fire. When we stopped for a quick break, I even found some peanuts on one of the rocks, left behind by some careless hiker. I tried to wolf down before Adam & Christine noticed, but they were quick to grab me before I did. I did have a few bowls of water to keep me hydrated and I got to eat some extra food when I got home. Difficulty – 2. The hike was really pretty easy, but 7 miles might be long for some people. Trail Conditions – 4. The Appalachian Trail is typically in good shape, but this section was especially nice and not too rocky at all. Views – 5. Many excellent places to take in the scenery below. Solitude – 2. This hike passes Loft Mountain Campground and the very popular Doyles River-Jones Run trail, so you’ll like see quite a few people. Directions to trailhead: Park one vehicle at Brown Gap, near mile marker 83 on Skyline Drive. 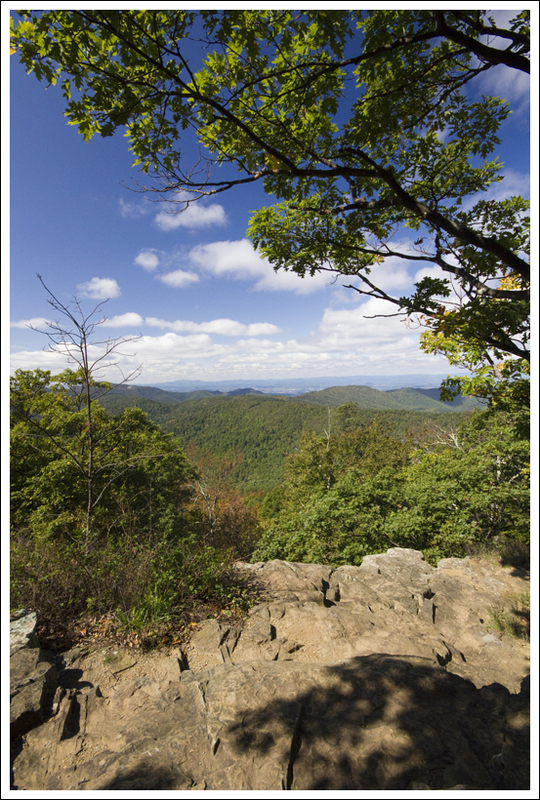 Then drive up to the Loft Mountain wayside, near mile marker 79 on Skyline Drive. The trail begins across the street on the north side of the wayside. Well, first of all…..happy belated anniversary to the two of you. This trip report was a pleasure to read, I liked the combination of pictures you shared and the old memories.You’re right, by the way, that snapshot of the Ent is startling! I’m doubly impressed Wookie made it so far. 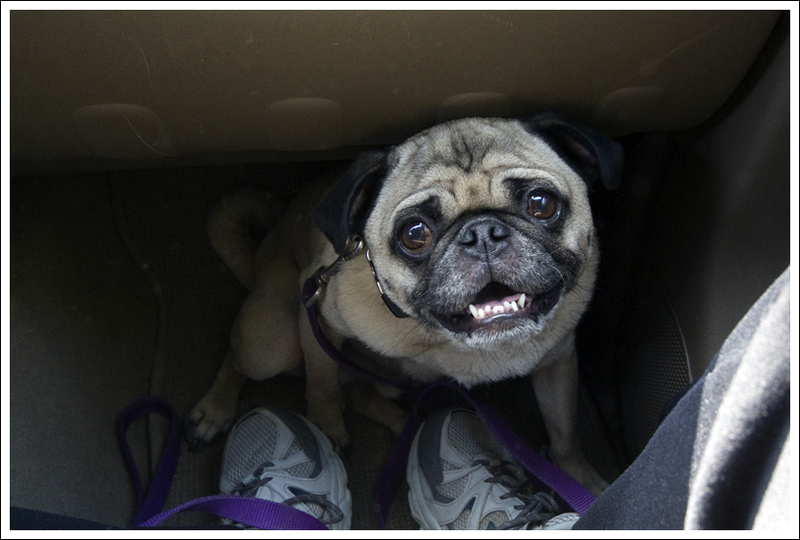 7.1 miles is the equivalent of 14 miles for little pug legs. 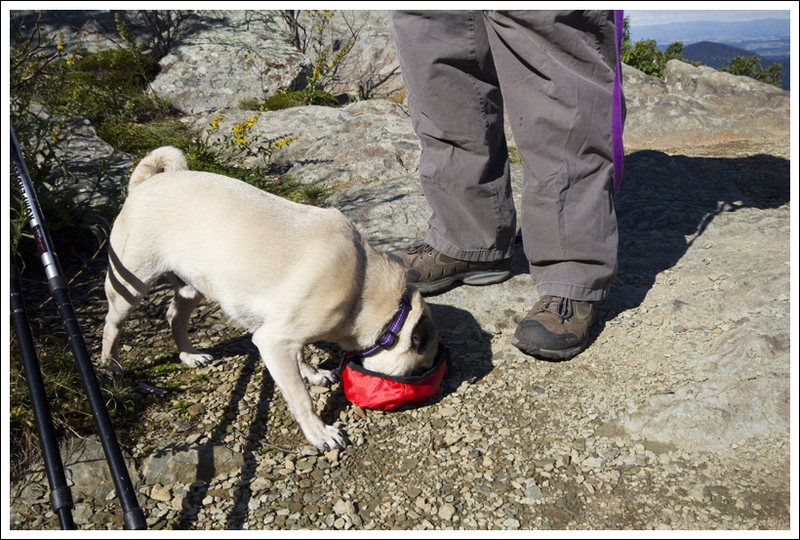 Lucy the Pug has been on some big hikes in her lifetime, but it has been a long time since the last one.